Dried at low heat and ground just before bottling to ensure all their flavor makes it into your recipes. Foodies and home chefs know how onions brighten up the flavor of almost any savory dish, soup, or dip. With Raema Rotindo's gourmet seasonings, they'll discover the difference quality makes. Supermarket dried onions often lose their punch during processing and packing, but each variety in this set uses only the flavorful interior of the onion, is slow-dried at low heat, and is only ground right before bottling to ensure all that impact makes its way to your mouth. 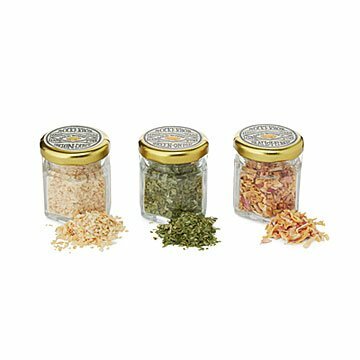 Yellow Onion Dust is rich with classic onion flavor, and will bring new life to all your favorite recipes. Green Onion Dust brings its sweet, delicate flavor to dips and sauces, omelets, pizzas, and more. And Shallot Flakes pack a bold flavor, with large flakes that can be rehydrated and used just like fresh shallots. Made in Baltimore, Maryland and packed in Schoharie, New York at a facility that provides employment for adults with special needs. You might say that bold flavors are in Raema Rotindo’s blood. Her grandfather and great-grandfather were garlic farmers in Webster, New York. As a child, Raema spent time watching her great-grandmother braiding garlic bulbs into long strands, and tasting roasted garlic fresh from the grill. These sweet memories of spice and flavor left Raema dissatisfied with the products she found on grocery shelves. She decided everyone should have access to pure, homegrown spices, from tea to turmeric. Now, you can enjoy her delicious, aromatic masala chai and golden milk concentrates for lattes, baked goods, or even cocktails. Packaging: 6.25" H x 2" Dia.